The very nature of porcelain (see previous post) allowed artisans to produce pieces with thin walls (even as thin as paper)—yet porcelain was stronger than stoneware! And, porcelain was less expensive than silver, Mueller added. Perfect for 17th-century coffee and tea. Which Led to Novel Adaptations . . .
Around 1680, a resourceful Dutchman bravely drilled into an mid-1600s Chinese porcelain gourd vase and added gilt fittings (shown on right). Voilà! The first porcelain coffee pot in the West! And although the Chinese preferred using Yixing stoneware, they quickly responded to the European demand for porcelain tea ware. There was clearly great sales potential here—at least until the Europeans figured out how to make their own porcelain! And indeed, millions of pieces of porcelain were imported by the Dutch East India Company alone. Porcelain served both as ballast on the ships (especially helpful since tea was relatively light in weight) and as profitable merchandise. So China came up with designs specifically for the Western market, and initially produced export teapots of underglaze blue-and-white. Underglaze painting had been developed in China centuries earlier, around 1000 AD.‡ For blue-and-white ware, a white slip (a mixture of pigment, the components of the porcelain itself, and water) was first applied to the piece. Using imported cobalt, designs were then hand painted on the white ground—errors in painting could not be corrected—and the piece was fired. A glaze, which brought out the true color of the blue, was applied, and the piece was again fired, completing the process. The example shown below is an underglaze blue-and-white teapot that dates to 1643 and features an Asian aesthetic. Its lid is a solid piece of porcelain, not pierced in any manner. And here is where that liquid-absorbing property of Yixing stoneware (see my previous post) comes in. As Mueller pointed out, the lids of Yixing pots did not generally have a vent to allow steam to escape because that wasn’t much of an issue. When hot water is poured into the pot, the pot itself absorbs some of the liquid. But when hot water is poured into an impervious porcelain pot that does not have a perforated lid, there is nowhere for the steam to escape as the tea steeps. Hence, the hot liquid rises up the spout! This, the Europeans definitely did not like. But with communication between East and West a years-long affair, it took awhile—decades actually!—for improvements to be incorporated. Rather, it seems there was some confusion in China as to why the vent in the lid was needed, as evidenced by the existence of some lids with partial perforations. In these, the holes either do not go fully through or are mere pinpricks. This ineffectual venting would not have prevented the hot water from rising into the spout. By 1750, however, most lids were vented for steam, thereby solving one problem. So, Were There Other Complaints? Well, there was that problem of tea leaves clogging in the spout . . . In addition, the falling price of tea brought about other stylistic changes, while motifs became increasingly westernized. All coming in my next posts! †Malone, Laurence A., How to Mend Your Treasured Porcelain, China, Glass, and Pottery, pp. 104–105. Reston, VA: Reston Publishing, 1976. ‡Weiss, Bustav, The Book of Porcelain, translated by J. Seligman, New York: Praeger, 1971. §Pers. comm., Sept. 2016. 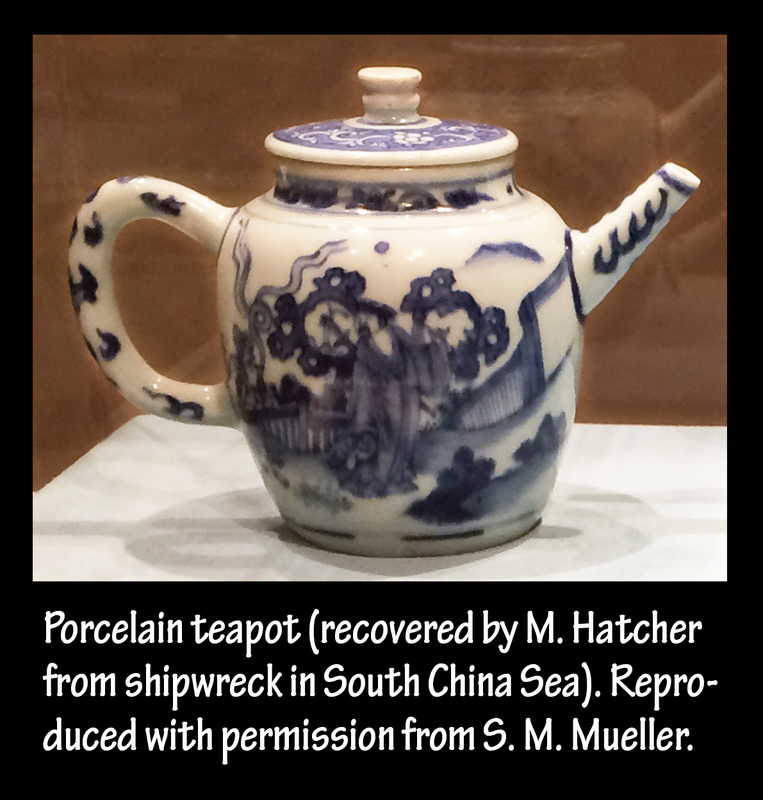 Also, Mueller, Shirley, “Lifting the Lid: Early Chinese Export Teapots,” Transactions of the Oriental Ceramic Society 71:89–93, 2006–2007. Next > China Teapots of the 1700s: Are They Still Chinese?